This is an interactive session, with an optional social media extraction of the participant’s choice and a sharing of the participant’s findings to the group. Participants are encouraged to bring their laptops. The room will be open at 1 p.m. The presenter will be using the Windows version of the software. No RSVP is required. All are welcome. Post-event, if there is interest, the presenter will demonstrate some other tools that enable the easy extraction of all images or videos from a website; the mapping of HTTP networks; network analysis of user accounts on Twitter, Facebook, and YouTube; the mapping of related tags networks on Flickr, and more (to enlarge the sense of what may be accomplished with social media data). These latter demos are complementary to (not replicative of) what may be achieved with NCapture and the related NVivo. 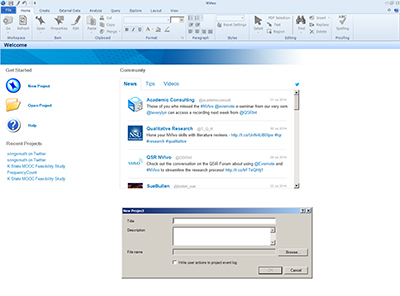 K-State has a site license for NVivo 11 Plus and NVivo 10 software (for both Windows and Mac systems) for all faculty, administrators, staff, and graduate students, who are each allowed two downloads and installs of the software. k-state.edu/ID/KStateNVivoDownload with a current eID and password. QSR International offers some superb video tutorials and both free and for-pay events. Those who have already started using NVivo may want to refer to “Using NVivo: An Unofficial and Unauthorized Primer,” which is an evolving e-book built on the Scalar platform that highlights various features of the tool.